New Solution for iTunes Unknown Error (-1/1) - Recommended! New Solution for iTunes Unknown Error (-1/1) – Highly Recommended! Nothing disrupts the smooth running and user experience more than errors that pop up on the devices. While some errors are minor and can be easily rectified, some errors are more serious and affect the performance of the devices and also inhibit the functionalities of the device altogether. iTunes unknown error -1 is one of the errors that can impact your experience using your device. If you are an iPhone user, you sometimes need to restore your device using iTunes to fix certain issues. If you receive an error, “This iPhone could not be restored due to an unknown error (-1)” on your device, you know that you are likely going to have a hard time getting your device back to full functionality. The main reason for iTunes unknown error (-1) is either as a result of corrupted data during a full restore process or a hardware-related problem known as a corrupted baseband chip. This error usually pops up during the restore process when iTunes attempts to update the baseband of an iPhone. There are several ways of fixing iTunes unknown error -1 on your device and here are some of them. iMyFone TunesFix is cutting-edge technology and application that is made specialize in fixing all types of errors your iTunes may give. Not being able to use a device due to some errors is a great hassle and inconvenience. So, iMyFone TunesFix was made to offer a comprehensive solution to the iTunes unkknow error -1.
iMyFone TunesFix provides the solution for all errors and issues with iTunes. Fixes over 100 iTunes errors such as install, connect, restore, backup, and lots more. Cleans and removes junks such as iTunes media, cookies, logs, old backups, and iOS update files. Boosts the speed and efficiency of your iTunes. Deep un-installation of iTunes and all related components. When the error message pops up on your device, it creates a terrible feeling of disappointment. However, iMyFone TunesFix will resolve any error that your iTunes has. Start the iMyFone TunesFix app, and it will detect the error and other issues with your iTunes automatically. If there are problems, the software will show you, you can click “Repair” to fix it. If the auto-fix cannot repair the error, please click “Fix Other iTunes Problems” to access the repair option you can use to fix the error out of over 100 errors. Click “Repair”, and the error will be handled accordingly. Note: When repairing your device’s system, make sure you have a stable network and is turned on. 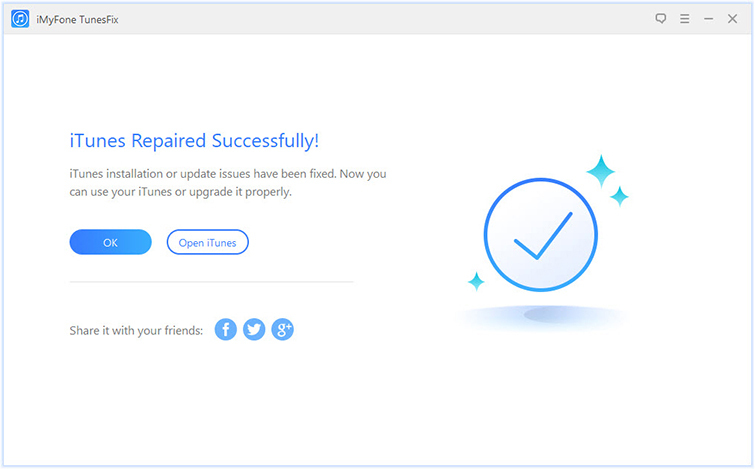 iMyFone TunesFix will successfully fix the iTunes unknown error -1 and restore your iTunes to its functional condition again without losing your data, and you can maximize the use of your iTunes. iTunes unknown error -1 could be a serious problem if it cannot be resolved. The first step is to check if the error resulted from a hardware malfunction by checking your IMEI number. From your home screen, go to “Settings,” click General and then click “IMEI.” If your device’s IMEI number does not come up, your device has developed a baseband corruption or hardware issue. Open the Software Update page and install all available updates there and ensure that your operating system is fully completed and updated. Click on the Menu to update the iTunes to the most recent version. To guarantee the success of this update, make sure that your internet is working. Third-Party antivirus software can interfere with the smooth running of the restore process by blocking the access to the internet; therefore, deactivate your antivirus and also your Firewalls. Remove any accessory from your system like scanners, printers, external hard drives, cameras, and other USB devices. Connect only your keyboard and mouse. Then reconnect the iPhone and restart your computer. Having reconnected and restarted your system, RESTORE your iPhone again, it should complete successfully, and you can enjoy your device again. In conclusion, to prevent iTunes unknown error -1, always ensures that your device’s operating system is up-to-date to give you a seamless experience. However, like we mentioned above, there are two ways for you to solve the error. In my opinion, using iMyFone TunesFix is much easier than the second solution.